Wendell HAS to win at everything, and if he doesn’t, he whines about it. 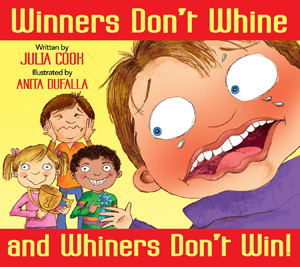 This story addresses two very challenging topics: winning and whining. When Wendell has one of those days where nothing seems to go his way, his mom helps him understand that everything in life doesn’t have to be a contest and that losing does not make you a loser. In fact, it can make you stronger! She also points out that although it feels great to celebrate a win, winning isn’t everything, and whining about things just makes it worse.